Granite countertops are not just limited to the kitchen, when it comes to their overall usage. You can use them in a lot of interactive ways, where they offer you best functionality. They are durable, attractive, offer you sustainable practicality and all these points makes them highly desirable for countertops usage, apart from their regular kitchen countertops use. If you have granite kitchen countertops, then you can be rest assured, that you have a lot better chances of finding a buyer. Did you have an idea that you can add granite countertops outside your home such as outdoor kitchen and patio? As granite is formed deep into the earth’s surface, it can hold up against the outdoor elements with ease. You don’t have to worry about the harsh temperatures, hot and cold months and various other forms of precipitation as granite holds well against all these points. There are wide array of opportunities available, where you can use the granite countertops outside your home. If you have a house that has open space, then you can utilize it in a lot more effective manner to increase the functionality of your home. Here are some of the ways. If you have a barbecue are in the garden, then it is the prime location for entertaining the guests. Regardless of its position near the pool or patio, you can get the granite cut into a shape that you want and you also have a choice to get it into the shade of your liking. Like the kitchen countertops, the granite countertops here can also be measured and the hole for the sink can be cut in it. As granite offers you a very high durability, you can be at peace of mind and don’t have to worry about the high temperature of the barbecue. You can also use the granite countertop for the poolside seating. As granite is very durable, you don’t have to worry about the weight and you can shape the seating in a way that it can also act as a poolside bar. If you have a lot of space in the garden and have a budget, then you can consider an outside kitchen to the patio area. This is really a very good option if you are too much into outdoor entertainment and barbecue. You can include features like brick oven with the granite kitchen countertops mantel. 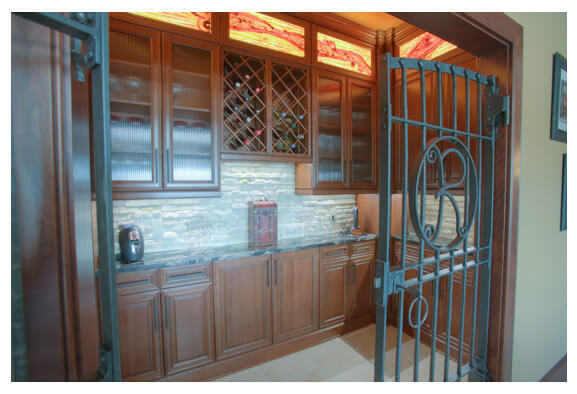 You can also add the granite countertop to the areas where you have kept the beverages for the guests. For the seating arrangement, the granite can be added below the countertop and can be used as a bench to give the arrangement a seamlessly integrated look. Before making your choice, always ensure that you are taking the granite countertop from a supplier that has good options available for you to choose from and offers you best deals in the market.